What a grim result Jesus predicts for His disciples as He sends them out. Two words jump out at me from our reading: WORRY and FEAR. Jesus says, when, as a result of their message, they are brought before synagogue councils, governors and kings, they are not to WORRY beforehand about how or what to say (Matthew 10:19). 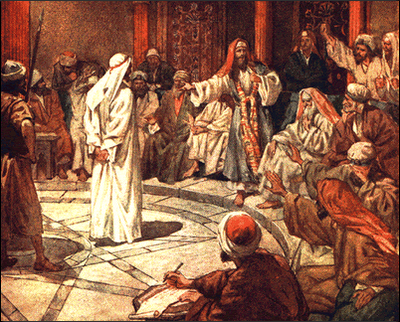 They are not to be distracted, preoccupied, stressed and pressured over how to defend themselves because if they are, they'll miss the best defense they could have—the one from the Holy Spirit: " 'For it will be given to you in that hour what you should speak; for it is not you who speak, but the Spirit of your Father who speaks in you' " Jesus says - Matthew 10:19-20. You'd think words coming from God Himself would guarantee freedom. But not so. For Jesus goes on to speak of continuing persecution and even death which they are not to FEAR (Matthew 10:26,28). At first this appears puzzling. If the persecutors can do the ultimate—kill one—why would the objects of their persecution not fear? Because, Jesus implies, killing the body isn't the worst thing that could happen to one. The worst is something only God can do (and reason to fear Him): "destroy both soul and body in hell." So, Jesus tells His disciples, take the long eternal view. Life doesn't stop here. So don't let your witness be extinguished by worry or fear of the worst that can happen in life. Rather, set your course by how you want to spend eternity. Jesus' advice about worry and fear is timely for us in our day when expression of our Christian worldview and faith is being met with increasing hostility. PRAYER: Dear Jesus, Your command to not worry or fear goes straight to my heart. Help me to be so controlled by Your Spirit that I will not only stop worrying about how to defend the gospel, but will speak it with Spirit-breathed boldness. Amen. I love how a reference to the trinity (God the Father, Jesus the Son, and the Holy Spirit) is embedded so subtly in our reading. Persecution comes because of allegiance to Jesus. The Spirit of the Father gives the persecuted one the words to speak in a good defense (Matthew 10:19,20).